Thomas Malory’s Le Morte d’Arthur (1485) was the first comprehensive collection of the legends of King Arthur and his Knights of the Round Table, and according to the opening credits of this film, Malory is the source material for the story, though considering the script, The Boy’s King Arthur by Sidney Lanier (1880) is a more likely candidate. 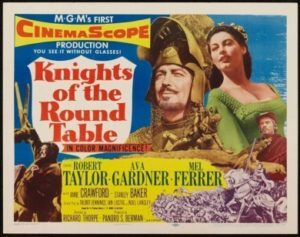 This is producer Pandro Berman’s follow-up to the hugely successful Ivanhoe, with the same director, crew, male lead (Robert Taylor), and composer (Miklós Rózsa)—but this time the team stumbles. It’s harder to boil down a collection of tales like Malory’s into a coherent story than it is to adapt a novel, and Merlin, Guinevere, Arthur, and his knights are more archetypes than fleshed-out characters, two problems that movie doesn’t successfully solve. Let’s just get the failings of this flick out of the way so we can focus on what’s worth watching in it. First of all, the dialogue is atrocious, stilted Ye Olde Englishe, and the actors deliver it dead on arrival, as stiff as slabs of oak. The characters are all simple and shallow, with about one note apiece (archetypes, remember?). The knights are awkward in their foolish Hollywood plate armor, and the knight-on-knight combats are reduced to painfully artless flailing that goes on way too long. And though the heart of the story is the Arthur-Guinevere-Lancelot love triangle, as it should be, Sir Percival’s quest for the Holy Grail is clumsily and intrusively shoe-horned into the narrative, possibly to give the film some moral cover in the staid 1950s, since otherwise it’s basically a tale of medieval adultery. Percival having divine visions is disturbingly out-of-tone, as it’s the only supernatural aspect retained from the tales: Merlin here is just a wise old advisor, not a wizard, and Morgan le Fay uses poison rather than magic. But this movie is still worth your time, for two reasons. First, it succeeds as a visual spectacle. Based solely on looks, the casting is perfect: Taylor is proud, upright, and stern as Lancelot, Ava Gardner as Guinevere would make any knight forsake his vows, Mel Ferrer is earnest and leonine as King Arthur, Stanley Baker sneers convincingly as Modred, and Gabriel Woolf as Sir Percival looks like he stepped right out of a Pre-Raphaelite painting. There are two large pitched battles that are surprisingly effective—clearly director Richard Thorpe had studied his Eisenstein. And over and over the composition and staging of scenes and individual shots is impeccable: sharp, painterly, and memorable. Finally, as dumb as the script is—and it’s real dumb—the basic plot of the rise and fall of Camelot as embodied in the love triangle of the three principles is such a strong story that it works anyway, despite the crappy dialogue. There’s real emotion in this timeless tragedy, and Gardner and Taylor manage to wring it out by heroically underplaying their rôles while everyone around them is hamming it up. Surprising, but there it is: go figure.